Need more information about booking Home 656308 ? A superb 5-Bedroom, 3.5 Bathroom Executive Pool Home with Games Room (completely redecorated and carpeted Dec'18). The ideal location for a fun family vacation. 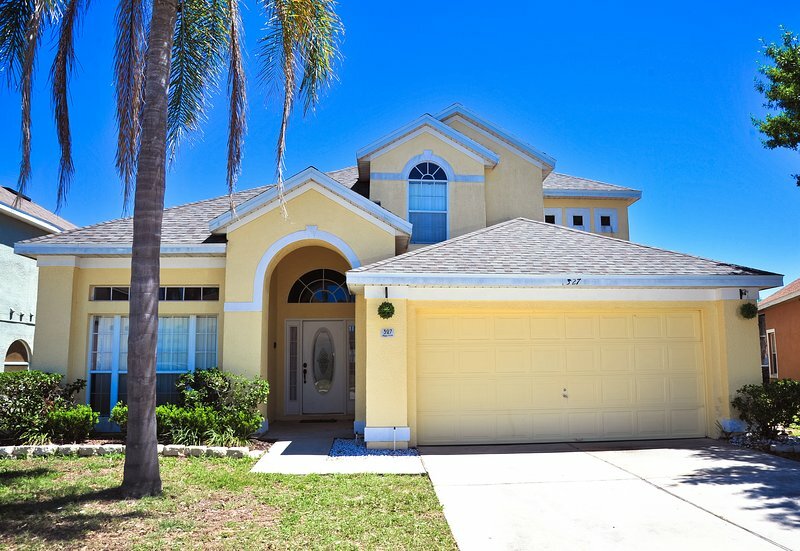 Just 15 minutes from Disney & 25 minutes from Universal Resort and Seaworld. Free Wi Fi , Cable TV, Free Local and National Calls and all bedrooms are provided with flat screen TVs and DVD players.The villa is on 2 storeys; downstairs has 2 master bedrooms both with ensuite bath / shower rooms and on the first floor are 3 twin bedrooms with a separate family bathroom. (travel cot & high chair are available on request at no extra charge ). Situated in a quiet residential location, comfortably furnished, with all towels and linens supplied. Close to numerous restaurants including Applebees, Longhorn Steakhouse, Olive Garden, Bahama Breeze, Red Robin and Millers Ale House with cuisine to suit all tastes, and of course there's always a McDonalds, Dennys, KFC or Dunking Donuts just about everywhere. If it all gets too much try a quiet relaxing night in and just turn on the BBQ, sit back by the pool with a refreshing soft drink or cocktail for the adults " the Ice is free" from the American Fridge Freezer and recharge your batteries ready for the next park/shopping spree. Walmart and Publix are just a mile or so away to cater for any day-to-day shopping needs with a more than extensive selection of "Umm just about everything". For the more energetic among you after a long day at the parks why not try the games room with brand new 8' Pool Table, Foosball, Table Tennis or Darts. Alternatively you can take a 3-minute walk to the end of the road and use the larger pool, tennis/basketball courts or child's play park exclusive to residents in our road. Our property is fully managed so there is never a worry about being able to contact someone while you're there, should you need any information, advice or or have any requests. For the shoppers among you ready your cards for action with the mind-boggling choice of malls and outlet stores i.e. Premium Outlets, Millenium Mall, Florida Mall and Posner Park plus many more. NB: Additional luggage maybe required on your return journey. Nearest beaches are approximately 1 hour away, either head east to the coast to Cocoa Beach taking in Kennedy Space Centre or head just up the road to the World Famous Daytona Beach and check out the Daytona Speedway home of the Daytona 500. Alternatively head west towards Tampa Bay and the more tranquil settings of Clearwater and St Petersburg. We are sure you will enjoy our home as much as we do and look forward to seeing you in the future. Prior to your arrival we will endeavor to make your Orlando Villa Experience as smooth as possible and supply as much info as we can. If you need something specific please ask and if we do not know (after 25 years of visiting ) then we will try to find out. Please note pool heating can be available in winter months for a small additional charge! You can get in touch with Gary and Lorraine (the owner) through the contact form on this page. Send Gary and Lorraine (the owner) an email through the contact form on this page. Alternatively, if there’s a phone number on this page, you can call them. How do I contact Gary and Lorraine (the owner)? If you’ve already booked, go to Manage your holiday booking to view Gary and Lorraine the owner's contact details or send them a message. Or send Gary and Lorraine (the owner) an enquiry through the Contact the owner/manager form if you’d like a quote or more info first. When you pay online through the Book your stay form, a booking request is sent to Gary and Lorraine (the owner). You’ll find out within 24 hours whether they’ve accepted - no money will leave your account before then. You can also request a quote from Gary and Lorraine (the owner) through the contact form. The owner will email you the total cost for your dates and a link to book and pay online. Use the Book your stay form to pay provisionally online. You can pay by credit/debit card or PayPal. Gary and Lorraine (the owner) will have 24 hours to accept the booking and no money will leave your account before then. Why can't I call Gary and Lorraine (the owner) before booking? You’ll need to contact Gary and Lorraine (the owner) to do this. Send them a message in Manage your holiday booking or through the contact form on this page. You can request to change the dates or number of people on your booking via the Manage your holiday booking page. To change your holiday dates use the Edit booking button. If you need to change the number of guests staying then send Gary and Lorraine (the owner) a message. If Gary and Lorraine (the owner) agrees, they’ll send you a revised quote outlining the changes. You can review and accept/decline this from the Manage your holiday booking page. You’ll have 48 hours to take action before the revised quote expires.